My final summer reading list is for middle school readers, the kids “in between” middle grade and young adult books. The eight books listed below include characters and dialogue unique to the experience of kids ages 12 to 14. The Secret of Black Rock by Joe Todd-Stanton is magical from the end pages to the final scene. Erin, the little girl at the center of the story, lives in an idyllic seaside town with her “mum” and her dog, Archie. Erin desperately wants to “go out to sea,” but she can’t because of a scary black rock. Everyone in town warns her to stay away from the rock which, naturally, makes Erin even more curious. Ultimately, she finds a way to learn the truth, and it turns out to be quite lovely. School ended a few days ago, and I’m already planning to make The Secret of Black Rock our first read aloud in September! A few months ago I read a young adult book about love. 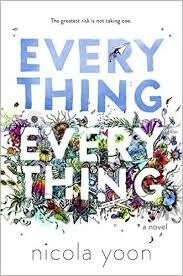 A common enough subject – but Nicola Yoon’s debut novel, Everything, Everything is different. It’s not only about love between two young people experiencing its joys and challenges for the first time, but other kinds of love as well. Maddy is a 17-year-old – half Japanese and half African-American – girl who has never gone to school or the mall or to a friend’s birthday party. She has a rare disease that requires her to live indoors in a climate-controlled apartment. I was thinking about similarities to The Fault in Our Stars as I started reading, but Yoon’s novel is something different. As Tolstoy said, “All great literature is one of two stories: a man goes on a journey or a stranger comes to town.” So I knew that Maddy’s unquestioning acceptance of her situation was going to be challenged when a “stranger” (in the form of a new family moving next door) “comes to town.” Among the family members is Olly, the first boy Maddy has ever known. I wondered how Yoon was going to connect Rapunzel with her neighbor, but seeing each other through a window solves that problem. And it’s not long before Olly holds up a sign with his email address for Maddy to see. She writes first: “Hello. I guess we should start with introductions? My name is Madeleine Whittier, but you can tell that from my e-mail address. What’s yours?” And that’s it – a conversation and a challenge begin. Yoon fills her novel with e-mails and IM messages and Maddy’s health charts and schedules and lots of other stuff which provide energy and immediacy to the story. I found myself turning the pages faster and faster to see how this impossible situation was going to resolve itself. But there are some twists and turns along the way. Everything, Everything will be published on September 1. I recommend it to readers ages 13 and over because spoiler alert: they find a way to get together! Yoon’s novel was just given a starred review from Kirkus and it is the September selection of the Parnassus (Ann Patchett’s independent bookstore in Nashville) Young Adult Book Club. Three Books and Two Paintings…. It was a strange reading week. Not bad, just unexpected. I had the week off from school so my expectations (and my “to read” pile) were high! 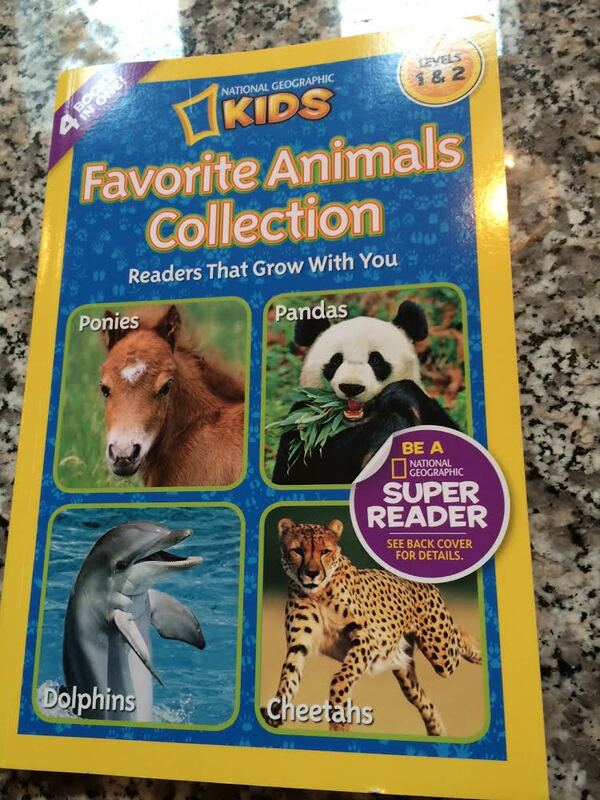 As it turns out, I read one young adult novel, two excellent picture books, and lots of magazine articles that were beginning to collect dust. Here are the highlights – and two paintings…. I work in a school library in Greater Boston so of course, this new picture book was on my list. 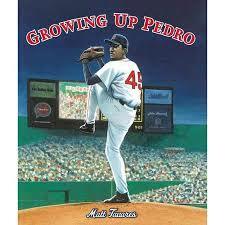 Tavares’s new book is as much about the love between Pedro and his older brother, Ramon, as it is about baseball. The book opens in 1981 in the Dominican Republic where Pedro “sits in the shade and watches the older boys play.” It’s Ramon, a pitcher, who is the baseball star of the Martinez family, and when he moves to Los Angeles to play for the Dodgers, Pedro is motivated to practice harder and join his big brother. Of course, he does – and he gets to play alongside Ramon for a few seasons. But Pedro, becomes the bigger star – a member of the Hall of Fame, an eight-time All Star, and three-time winner of the Cy Young Award. This is a warm book about the love between two brothers with big dreams. My bet is that this one will be checked out within an hour of putting it on display! This is a book with very few words – and it is one of the most beautiful books I’ve ever read. 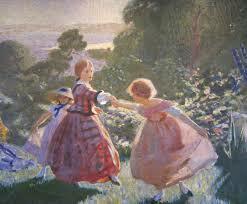 It’s about everything – the passage of time, the seasons and growth, and above all, the rewards of friendship. There is a page with nine words that made me feel genuinely heartbroken. 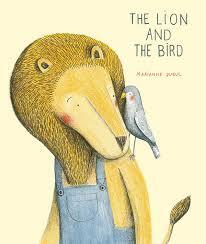 As the title says, the story is about a lion and a bird. It’s a fall day and Lion is working in his garden when he sees a bird with a hurt wing. “Let’s bandage you up,” says Lion “That will help.” During the bird’s convalescence, his flock leaves, but the Lion invites him to stay for the winter. After one of the coziest picture book winters I’ve ever seen on the page, the birds return and that’s when the sad scene takes place. There is a happy ending so no worries about a sad child (or adult). But here’s the best part of Dubuc’s book – as spare as it is, it’s one to return to again and again. I definitely will. This is the young adult novel I read this week – and although I didn’t read as many books as I planned, I picked the right one. Wow – this one will stick with me. Mosquitoland is a road trip novel. The traveler is sixteen-year-old Mary Iris Malone who goes by Mim. 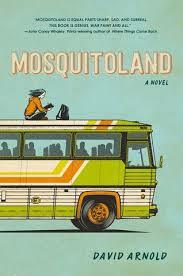 She is traveling from her father’s house in Mississippi (Mosquitoland) to her mother in Cleveland. Mim is convinced that her father and stepmother are keeping something important from her so she hits the road. 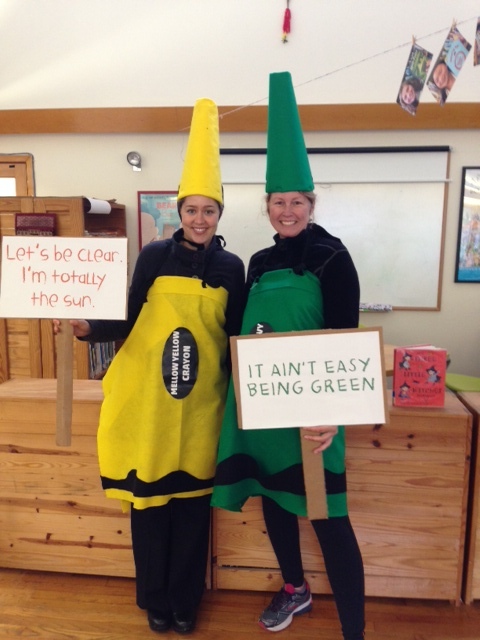 Of course, there are bumps along the way and some shady characters. There is also humor, a bit of romance – and life lessons. To be clear, there are some serious issues addressed here: sexual assault, intellectual disabilities, depression and violence. Overall, Arnold’s novel is bighearted and generous and Mim’s journey is one of self discovery, but I recommend it to mature teens. I took these pictures at the Cape Ann Museum. 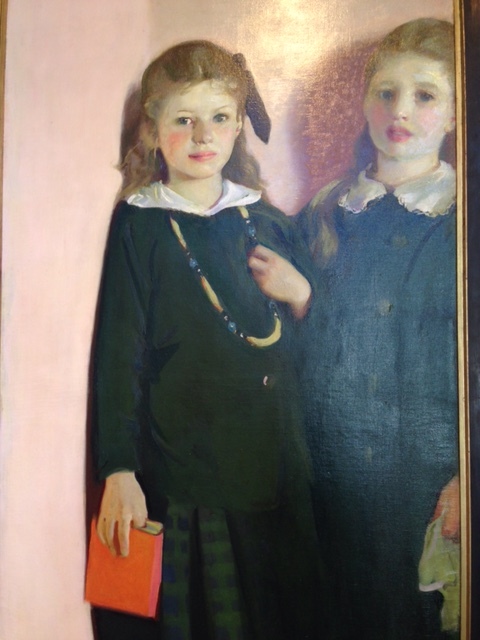 They are both by Charles Hopkinson, a Boston painter who lived between 1869 and 1962. This one looks like the cover of a Henry James novel…. 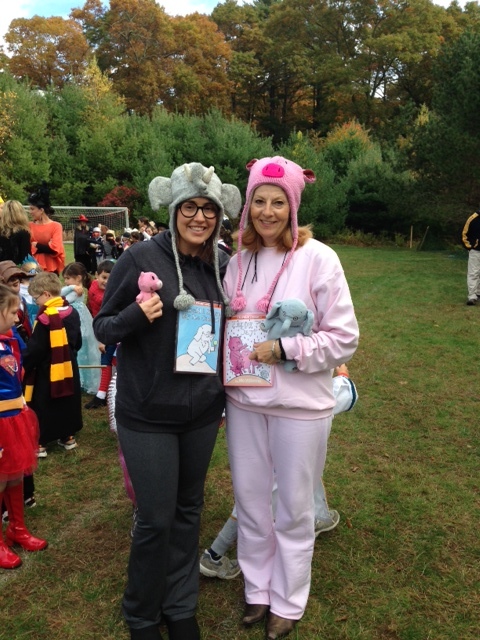 Addison Stone and a Report from the Halloween Parade…. Last night I finished reading The Unfinished Life of Addison Stone by Adele Griffin – the perfect Halloween weekend novel: a tragic ghost story about a girl who, after she dies, continues to exert power over everyone in her sphere. A fictional “biography” of a teenager from small town Rhode Island who becomes a star of the Manhattan art world, Griffin’s novel addresses fame, mental illness, and the high stakes art world in this multi-voiced novel. 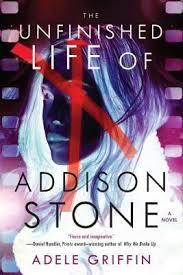 As the book begins, Addison Stone has already died in mysterious circumstances. What follows is a series of interviews, media coverage, artwork, and e-mails that give contradictory reports of Addison’s life. Ultimately, Addison remains somewhat unknowable, but the people who suffer or benefit from their relationship with her come sharply into focus. 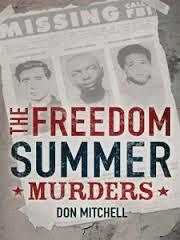 I would recommend this book to readers 14 and over. 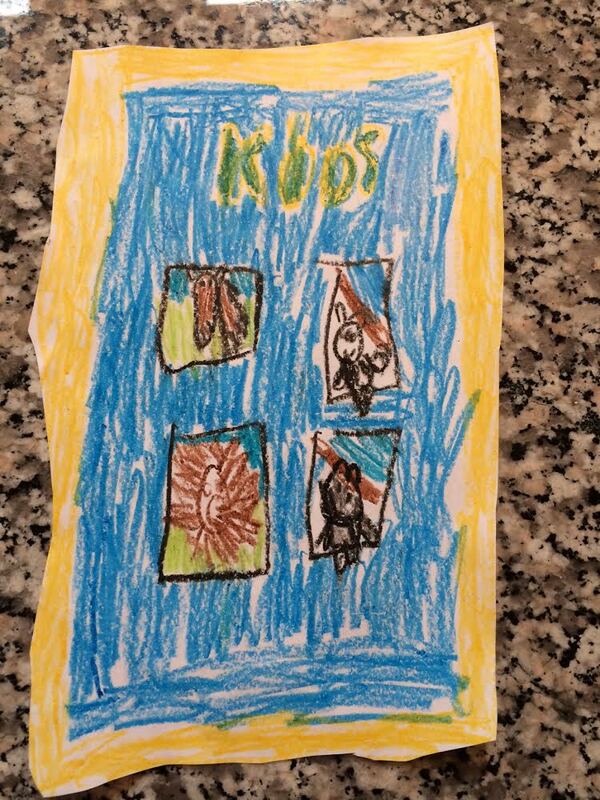 Here’s the book she wanted – not bad, right? As a member of the Leadership Club and an honor student at LongwoodMiddle School, Sierra Shepard helped create the banner announcing the school’s creed: “Rules, Respect, Responsibility and Reliability.” The school has established an iron-clad zero tolerance policy on weapons, but when Sierra accidentally takes her mother’s lunch bag to school, she finds it contains a paring knife. A loyal rule-follower, Sierra turns the knife in to the office, assuming that her spotless record will exempt her from the consequences of breaking a rule. That is not the case. Sierra begins a week-long in-school suspension during which she questions her assumptions about following rules, her classmates, and her parents and school administrators. Sierra also reexamines her feelings about Luke Bishop, the school “bad boy” who is more complex and interesting than she thought. Sierra is a realistic and appealing character whose story will resonate with students who enjoy stories about school and friends. The novel could also spark a discussion about the slippery nature of rules and how they are enforced. 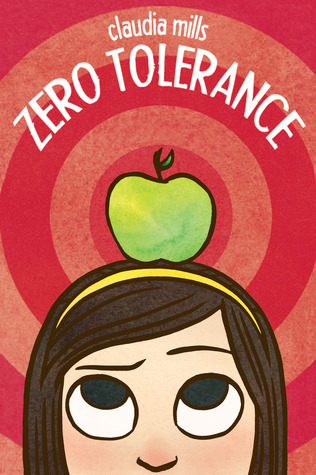 Unlike Claudia Mills’s school-based novels for younger readers, Zero Tolerance includes mild swear words scattered throughout the book, but they seem genuine to the age of the characters. A compelling novel for middle school age readers. One other thing for you today…. Not too long ago, on a flight between Boston and Dallas, I had the good fortune to sit next to a fellow book lover. 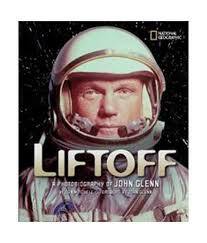 As we flew across most of the country, we talked about favorite books and the titles in our “to read” piles. 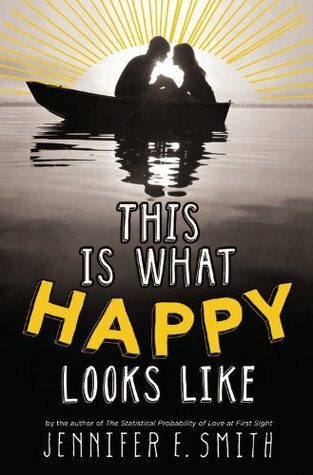 One book she recommended was This Is What Happy Looks Like, a young adult novel by Jennifer E. Smith. The title stood out because I had seen a few references to it, and as the summer drew near, I saw it on several summer reading lists. I finally had a chance to read it, and can tell you that if someone had walked onto our deck this afternoon and seen me reading Smith’s novel, they would have known “what happy looks like.” You can’t help smiling while reading the book. It’s so summery that it should come with suntan lotion and a cold beverage. But…don’t be mistaken. I’m not saying “beach read” to signal some kind of guilty pleasure without much true merit. Smith is really good. Even though I’m an adult reader who knew exactly how it would end (don’t you? ), I still found myself racing to the end. I knew it was going to be good from the first page. The novel opens with an e-mail exchange between Graham Larkin and Ellie O’Neill, the two main characters. Graham, a teenage movie star, is writing to ask a friend to take care of his pet pig….Wilbur! 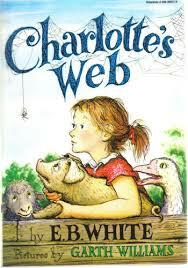 How can you not love a character who has a pig named after Charlotte’s Web. Graham’s e-mail included a typo in the address box which results in his message landing in Ellie’s in-box. Ellie lives in a small town Maine with her mother, but the teenagers begin a cross-country correspondence which becomes meaningful to both of them. It isn’t long before Graham uses his star power to arrange for his film to be shot on location in the land of lobsters and blueberries. This Is What Happy Looks Like is a delicious book. The local ice cream shop is called Sprinkles which kind of sums up the whole vibe. What I particularly enjoyed is that the story is told from both Graham’s and Ellie’s points of view, giving the reader a peek into how each of them see their budding romance and their misunderstandings.